1 FREE Winpro Giveaway at the Bottom of this review! FREE Winpro Giveaway at the Bottom of this review! Have you heard of WinPro? I’m assuming not. Today we are going to take a look at this company, test one of the products they offer and even give you a chance to get your hands on some for free! 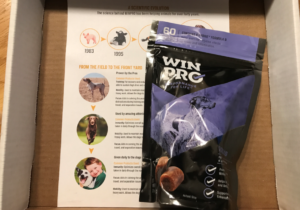 Before we get to the giveaway, I want to give you my honest review of the WinPro Focus for Calming soft dog chews. If you have followed us here on NewDogOwners.com, you probably know that Rosco is still a little overly affectionate, especially when we have guests. If not, read his story. You will find the giveaway at the end of my review below. Winpro is a company founded by Bill Bernardo. Bill was raised in Northcentral Iowa where he grew up as a typical kid. The idea was planted in his head as a college kid when he went on a hunting trip with a friend and his dog Hagger. Being the first time hunting with a dog, Bill was amazed at how hard Hagger worked. He also remembers Hagger enjoying himself the whole time jumping birds. He noticed how much work this dog was putting into his day. Bill being an active person himself, he knew how much energy the dog was using and the punishment he was inflicting on his body. Bill was a very active person himself. He enjoys running and biking in marathons. He knew back then that recovery time meant down time. Recovering from a hard workout can take days and no one likes taking time to recover. Bill then stated working for a larger food protein company a little later in life. And though it started out good, he found the company started cutting corners to make more money. Being that he could not in good conscious stand behind the products, he made a decision to leave. After thinking about his future and what his next adventure may be, his wife made a comment about doing something for dogs. Having five himself, he thought that was a good idea. Thinking about it, remembering Hagger and what he learned about animal blood protein while working for the other company, Bill made the decision to start WinPro. 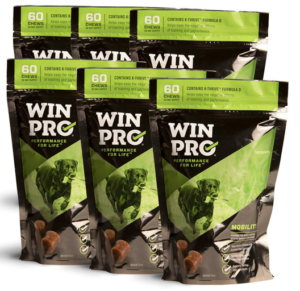 WinPro claims the main base ingredient in their products is animal blood protein. 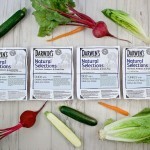 They claim many health benefits including it fighting inflammation and making the gut healthy. They also claim that the blood proteins are humanely collected from USDA inspected pork processing facilities located in the U.S.A. in the Midwest. WinPro has four products to date. 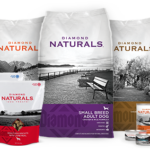 Each is geared to a specific focus point that dogs may need. WinPro Immunity for digestive health is specificity made to help give your dog a immunity boost and a healthy digestive system. 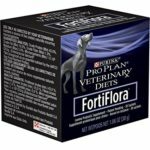 This is suited for dogs that have digestive issues or you want to give your pup a good base for a healthy life. Think probiotics for dogs. I’m not sure they re really the same thing but remember, it all starts with a healthy gut. The same is true for dogs as it is with people. Immunity will come in handy if your dog is in a stressful situation and they are prone to having “stomach issues” during those times. 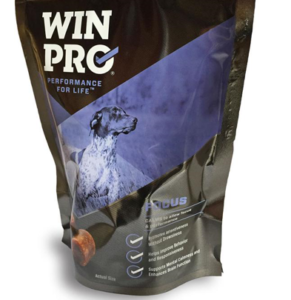 WinPro Focus is the soft chews that we selected for Rosco. The biggest issue with Rosco is how excited he gets at times. He has come a long way but is still “over the top” when we have guests over. We have trained and trained him and get nowhere. This is why we decided to give Focus a shot. Focus is specifically formulated to help your dog stay alert, relaxed and focused when other things are going on around them. This would come in handy during dog training and when there are temptations when excited. The Mobility for Joint Health is a soft dog chew to help promote just as the names implies. It helps active dogs with joint stiffness and getting sore after a lot of exercise or training. 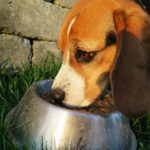 This recipe would be best for active dogs and dogs that may be getting up there in age. If you work your dog in sport this may also be for you. Long term joint care will pay off in the older years of your dog. 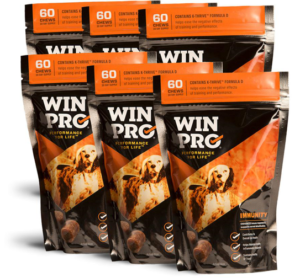 The WinPro Training formula was designed to enhance your dogs cardiovascular function and oxygen intake. They claim Training will help with performance, endurance and recovery time after hard workouts. I think of it like a we drink protein shakes after a hard workout. It helps recover the body, contribute to muscle gain/repair and gives you an extra boost of strength. WinPro Training would be best for dogs that are trained regularly in sports, dog shows and outdoor activities like hunting. 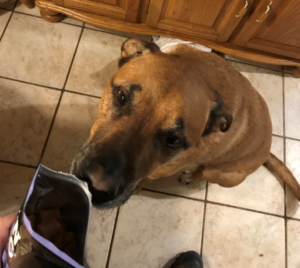 Before I get into the results of the WinPro Focus, I want to tell you about our dog Rosco and why I chose Focus to test. Linked in the first paragraph of this article, I linked to Rosco’s story. As you know (if you read it), we believe Rosco came from an outside dog family that lived in a pin. When we got him, he had a “wild side” to him. Finding out that our now 110lb dog was a mix a Sheppard, Lab and Grate Dame ads to his rambunctiousness. Before, and even after training, we needed to give Rosco doggy “chill pills” at times when we had guests over. He would constantly jump on people, run into others going full speed, etc from getting so hyper. He has come a long way in the four years we have had him. We have not had to use the chill pills for some time now. However, he still gets a little overly excited when someone comes over. It is not an overly big issue as he listens better, doesn’t jump nearly as much but, he still likes to get into a visitors personally space for the first 10-20 minutes of the visit. Most dogs do this and love to get attention but with his size, he can be a little intimidating, especially to children. This is where WinPro comes in. We were looking for an alternative to the chill pill as they are a little overboard on Rosco today. We were looking for something that could just level him out and keep him focused on commands, etc. Rosco is a very smart dog but stubborn. He knows his command but also acts like my teenage son with selective hearing. Shipping from WinPropet.com was delivered in two days using U.S.P.S. Priority Mail. It came packaged well within white box with padding and an information sheet on WinPro. The packaging looks nice in has a resealable bag. Rosco must have known I had something for him. As soon as I got the box open and opened the package, he must have smelled it. He came over and sat right in front of me. Pictured above is when I allowed him to give the WinPro Focus a little sniff. Though he went in a little hesitant, he started wagging his tail knowing it was for him. I gave him two the day I got them and two more the following morning starting the daily schedule. It was funny the next morning because when I got them out, he knew. He also knew that he would be getting two of them. I gave him the first and he laid it down waiting for his 2nd. Rosco seems to enjoy the flavor, I’m guessing the blood protein has a little to do with that lol. So does Rosco like them? I think he has given his approval. Notes: I have noticed that after each time I give Rosco the WinPro Focus, he goes right to the water bowl when he is done eating them. They are moist so I do not believe it has anything to do with needing water because of being dry. I’m guessing that though he enjoys the flavor, he is getting an aftertaste that isn’t agreeing with him or maybe it is triggering a thirst. Either way, he seems to like them. Keeping in mind that WinPro Focus is not a doggy chill pill but a focusing aid, we need look at a couple different things. 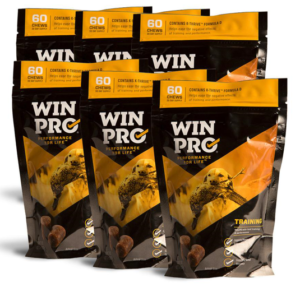 I’m sure WinPro will tell you that this is no magic pill that is going to make your dog super focused and relaxed after popping them a couple soft chews. These are not chill pills, but rather a daily long term approach to keeping your dog focused on tasks. Day One: We seen nothing out of the ordinary. He happen to be in a mood that day but looking away when we told him to do something like he never heard us. Day Two: Didn’t notice any major differences though we were only home in the morning and he was just hanging out with me. We didn’t work on any commands. Day Three: Today was the big test. Having family over for Thanksgiving. A lot of people and a lot of food laying around. I didn’t expect much since he has only been on it for three days. When people arrived, he did still get a little excited but went right to his crate when I gave the command. He settled down as soon as he went in and we were able to let him out within 5 minutes. He usually has to stay in for at least 30 minutes. After we let him out, he did good! He of course still wanted to say hi to everyone but didn’t jump and didn’t get overly excited. We had food all throughout the kitchen all night with us in the living room. Usually, it is a constant battle with him trying to sneak and take it. He knows better and is very deliberate in his moves to the food. This day, we didn’t have any issues with him. All that temptation and we didn’t have to say one thing to him. He just hung out with everyone and lost interest in us within 30 minutes. He did better than expected. After Week one: Yesterday was a week using the WinPro Focus. We have noticed small changes in his temperament. He is not as “stubborn” as he has been. Though he still likes to get a rise out of our outdoor cat Sam. I think he does it because he knows he can get the cat to freak out just by looking at him. After One Month: So it’s been a month and Rosco is still on track. For the most part, it seems that his temperament peeked after about a week and has been steady since then. He is definitely better than when we began. Rosco has been a good dog ever since we did training. But he has always had a stubbornness to him. He knows, but does things anyway like a teenager. Over the first week of using WinPro Focus, we have noticed some slight improvements with him listening to us and not being so overly excited when people come to the house. This product is a long term enhancement and I expect him to keep getting better as time goes on using WinPro along with steadily working with him. Okay, back on subject. The instructions for use on the packaging says to give two chews to your dog once daily. Two chews twice daily for heavier training days. On the WinPro webite’s Product Usage page, it gives a slightly different dosage. For dogs under 20lbs: one chew once per day. Dogs over 20lbs: two chews once per day. It also states that if you have an event coming up like hunting, competition or any high activity/high anxiety day, you should double the dosage a week ahead of time through the event. Side Note: WinPro Focus is marked to be safe to be used along side the Immunity line. So, who wants a free 30 day supply of WinPro of your choice? It’s easy, just visit the giveaway page and sign up! The Contest has ended! We will be having another give-away soon. If you would like to know when, make sure to follow us on Facebook! We reached out to WinProto let them knw about our review. They were nice enough to offer a free 30-Day supply to one of our lucky readers. Along with that, they will send a WinPro hat. Hi Tiffany! I had it written up but never updated the post… oops… I now have it updated. Please make sure to come back and share your results with everyone!